Ally Carter’s Embassy Row series began with All Fall Down, continued with See How they Run, and now ends with this final installment. I read the first one two and a half years ago and I still vividly remember how it made me feel. I remember the tension and the stomach clenching and the suspense. Am I an Ally Carter fangirl? Maybe. Do I start out each of her books already knowing I’m going to like it? Maybe. If you haven’t read the first two books, get that done before you attempt this one. This is a solid conclusion to the series. Some of the tension is missing because the cards are on the table now—we know who the bad guys are and what they want. I know that at the time I read this (nearly a year ago) I gave it 4 stars, but I’m having trouble remembering specific details. Yet, I can clearly recall things that happened in the first book. 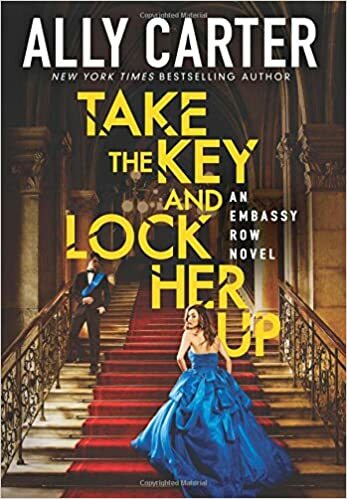 I’m not saying this to mean that I didn’t enjoy Take the Key and Lock Her Up, because clearly I did, but it may not be as strong as the first two books. Things are wrapped up neatly and I would still recommend this entire trilogy.